The aim of the study was to examine the relation between the self-esteem and empathic skill of the undergraduate students of preschool education department. The sample group was comprised of 3rd and 4th year students attending to Preschool Education Department, Primary Education, Faculty of Education of Pamukkale University. The General Information Form, the Empathic Skills Scale – Form B as developed by Dökmen (1988), and the Coopersmith Self-Esteem Inventory as developed by Coopersmith (1986) and adapted to Turkish by Turan & Tufan (1987) were used as data collection tools in the study. Relational screening model, a descriptive methodology, was used in this study. Simple Linear Regression Analysis and T test techniques were utilized for the purpose of data analysis. As a result of the study, it was found that there was a positive and weak relation between the self-esteem and empathic skill of the undergraduate students of preschool education department. The empathic skills of children increase with heightened self-esteem, and the same decreases with lowered self-esteem. The empathic skill levels of the undergraduate students significantly differed by self-esteem levels. The mean empathic skills score of students with higher self-esteem was comparatively higher than that of the students with low self-esteem. Augusto-Landa, J. M., Lopez-Zafra, E., Aguilar-Luzon, M. C. & de Ugarte, M. F. S. (2009). Predicti- ve validity of perceived emotional intelligence on nursing student’ self-concept. Nurse Education Today, 29, 801-808. Basch, M. F. (1983). Empathic understanding: A review of the concept and some theoretical consi- derations. Journal of the American Psychoanalytic Association, 31,1, 101-126. Batson, C. D., Fultz, J. & Schoenrade, P. A. (1987). Distress and empathy: Two qualitatively distinct vicarious emotions with different motivational consequences. Journal of Personality, 55, 19-39. Bayraktar, F., Sayıl, M. & Kumru, A. (2009). Liseli ergenler ve üniversiteli gençlerde benlik saygısı: Ebeveyn ve akrana bağlanma, empati ve psikolojik uyum değişkenlerinin rolü. Türk Psikoloji Dergisi, 24, 63, 48-63. Canavello, A. & Crocker, J. (2011). Interpersonal goals, others’ regard for the self, and self-esteem: The paradoxical consequences of self-image and compassionate goals. European Journal of Social Psychology, 41, 422–434. Ceylan, R., Yıldız-Bıçakçı, M., Gürsoy, F. & Aral, N. (2009). An examination of the relationship between teachers’ professional self-esteem and empathic skills. Social Behavior and Personality, 37, 5, 679-682. Coopersmith, S. (1986). Manual for the Self-Esteem Inventories. Palo Alto, CA: Consulting Psychologists Press. Çokluk, Ö., Şekercioğlu, G. & Büyüköztürk, Ş. (2012). Sosyal Bilimler İçin Çok Değişkenli İstatis- tik: SPSS ve LISREL Uygulamaları. Ankara: Pegem Akademi. Davis, M. H. (1983). Measuring individual differences in empathy: Evidence for a multidimensio- nal approach. Journal of Personality and Social Psychology, 44,1, 113-126. Dovidio, J. F., ten Verget, M., Stewart, T. L., Gaertner, S. L., Johnson, J. D., Esses, V. M., et al. (2004). Perspective and prejudice: Antecedents and mediating mechanisms. Personality and Social Psychology Bulletin, 30, 1537-1549. Dökmen, Ü. (1988). Empatinin yeni bir modele dayanılarak ölçülmesi ve psikodrama ile geliştiril- mesi. Ankara Üniversitesi Eğitim Bilimleri Fakültesi Dergisi, 21, 1-2, 155-190. Dökmen, Ü. (1995). Sanatta ve Günlük Yaşamda İletişim Çatışmaları ve Empati. İstanbul:Sistem Yayıncılık. Eisenberg, N. (1989). Empathy and Related Emotional Response. San Francisco: Jossey-Bass. Eisenberg, N. & Fabes, R. A. (1990). Empathy: Conceptualization, measurement, and relation to prosocial behavior. Motivation and Emotion, 14, 131-149. Eisenberg-Berg, N. & Mussen, P. (1978). Empathy and moral development in adolescence. Deve- lopmental Psychology, 14, 2, 185-186. Eisenberg, N. & McNally, S. (1993). Socialization and mothers’ and adolescents’ empathy-related characteristics. Journal of Research on Adolescence, 3, 2, 171-191. Eisenberg, N., & Fabes, R. A. (1998). Prosocial development. In W. Damon (Ed. ), Handbook of Child Psychology (5th ed. ), (pp.701–778). New York: Wiley. Finlay, K. A. & Stephan, W. G. (2000). Improving intergroup relations: The effects of empathy on racial attitudes. Journal of Applied Social Psychology, 30, 1720-1737. Garber, J., Robinson, N., & Valentiner, D. (1997). The relation between parenting and adolescent depression:Selfworth as a mediator. Journal of Adolescent Research, 12, 12–33. Gecas, V. & Schwalbe, M. L. (1986). Parental behavior and self-esteem. Journal of Marriage & Family, 48, 1, 37-47. Ghorbani, N., Watson, P. J., Hamzavy, F. & Weathington, B. L. (2010). Self-knowledge and narcis- sism in Iranians: Relationships with empathy and self-esteem. Current Psychology, 29, 135–143. Harter, S. (2012). The Construction of the Self: Developmental and Sociocultural Foundations. New York: Guilford Press. Hawkins, D. & Lishner, D. (1987). Etiology and prevention of antisocial behavior in children and adolescents. In D. Crowell, & I. Evans (Eds. ), Childhood Aggression and Violence: Sources of Influence, Prevention, and Control (pp. 263–282). New York: Plenum Press. Joireman, J. A., Parrott, L.& Hammersla, J. (2002). Empathy and the self-absorption paradox: Sup- port for the distinction between self-rumination and self-reflection. Self and Identity, 1, 53-65. Kalliopuska, M. (1987, Jully 12-16). The relation of empathy and self-esteem with active sporting. Paper presented at the Biennial Meeting of the Incernational Society for the Study of Behavioral Development. 9th, Tokyo, Japan. Kandemir, M. & Özbay, Y. (2009). Sınıf içinde algılanan empatik atmosfer ile benlik saygısı arasın- daki etkileşimin zorbalıkla ilişkisi. İlköğretim Online, 8, 2, 322-333. Karataş, Z. (2012). Eğitim fakültesi öğrencilerinin empatik becerileri ve benlik saygısı düzeylerinin incelenmesi. Mehmet Akif Ersoy Üniversitesi Eğitim Fakültesi Dergisi, 23, 97-114. Kıran, H. (1994). Okul öncesi eğitimi öğretmeninin kendisinden beklenen davranışları gerçekleştir- me düzeyi. Pamukkale Üniversitesi Sosyal Bilimler Enstitüsü Dergisi, 2, 72-103. Körükçü, Ö. & Aral, N. (2009). Okul öncesi öğretmen adaylarının empatik beceri düzeylerinin incelenmesi. 5. Uluslar Arası Balkan Eğitim Kongresi, Trakya Üniversitesi, Türkiye. Kristjansson, K. (2010). The Self and Its Emotions. New York: Cambridge University Press. Laible, D. J., Carlo, G. & Roesch, S. C. (2004). Pathways to self-esteem in late adolescence: The role of parent and peer attachment, empathy, and social behaviors. Journal of Adolescence, 27, 703-716. Larrieu, J. & Mussen, P. (1986). Some personality and motivational correlates of children’s proso- cial behavior. Journal of Genetic Psychology, 147, 4, 529-542. Leary, M. R. & Baumeister, R. F. (2003) The Nature and Function of Self-esteem: Sociometer The- ory. New York: the Guilford Press. Lochman, J. & Lampron, L. (1986). Cognitive-behavioural intervention for aggressive males. Jour- nal of Child and Adolescent Psychotherapy, 5, 15–23. Lowenstein, L. (1989). Homicide: A review of recent research (1975–1985). Criminologist, 13, 74–89. Mruk, C. J. (2006). Self-Esteem Research, Theory, and Practice. New York: Springer Publishing Company. Neumann, D. L. & Westbury, H. R. (2011). The psychophysiological measurement of empathy. In D. J. Scapaletti (Ed. ), Psychology of Empathy (pp. 119-142). New York: Nove Science Publishers, Inc.
Oğuzkan, Ş. & Oral, G. (1995). Okul Öncesi Eğitim. İstanbul: Milli Eğitim Basımevi. Oktay, A. (1991). Öğretmenlik mesleği ve öğretmenin nitelikleri. Marmara Üniversitesi Atatürk Eğitim Fakültesi Eğitim Bilimleri Dergisi, 3, 187-193. Oyserman, D., Elmore, K. & Smith, G. (2012). Self-self-concept, and identity. In M. R. Leary & J. Price Tangney (Eds. ), Handbook of Self and Identity (pp. 69-104). New York: Guilford Press. Paulson, M., Coombs, R., & Landsverk, J. (1990). Youth who physically assault their parents. Jour- nal of Family Violence, 5, 121–133. Russell, R., & Hudson, J. (1992). Physical and psychological abuse of heterosexual partners. Perso- nality and Individual Differences, 13, 457–473. Salı, G. (2013). İlköğretim ikinci kademedeki çocukların empatik eğilimlerinin ve benlik kavramla- rının incelenmesi. Kuramsal Eğitimbilim Dergisi, 6, 4, 496-519. Sarı, E. (2007). Türk üniversite öğrencilerinin aceleci, araştırıcı ve genel kararsızlık biçimlerinin kendilik saygısı düzeylerine etkisi. Kuram ve Uygulamada Eğitim Bilimleri, 7, 2, 897-926. Sayın, S. (2003). Farklı programlarda okuyan öğretmen adayı üniversite öğrencilerinin empatik eğilimi, öğretmenlik mesleğine karşı tutum ve mesleki benlik saygısı. Süleyman Demirel Üni- versitesi Burdur Eğitim Fakültesi Dergisi, 4, 6, 74-84. Spiro, H. (1992). What is empathy and can it be taught? Annals of Internal Medicine, 116, 10, 843-846. Staub, E. (1987). Commentary on Part I. In N. Eisenberg & J. Strayer. (Ed. ), Empathy and Its Deve- lopment. USA: Cambridge University Press. Stotland, E. & Dunn, R. E. (1963). Empathy, self-esteem and birth order. Journal of Abnormal and Social Psychology, 66, 6, 532-540. Tabassum, F. & Ali, M. A. (2012). Professional self-esteem of secondary school teachers. Asian Social Science, 8, 2, 206-210. Trumpeter, N. N., Watson, P. J., O’Leary, B. J. & Weathington, B. L. (2008). Self functioning and perceived parenting: Relations of parental empathy and love inconsistency with narcissism, depression, and self-esteem. The Journal of Genetic Psychology, 169, 1, 51–71. Turan N. & Tufan B. (1987). Coopersmith benlik saygısı envanteri’nin (SEI) geçerlik-güvenirlik çalışması. 23. Ulusal Psikiyatri ve Nörolojik Bilimler Kongresi, İstanbul-Türkiye, 816-817. Youniss, J. (1985). Parents and Peers in Social Development: A Sullivan–Piaget Perspective. Chi- cago: University of Chicago Press. Yüksel, A. (2009). İlköğretim 5. sınıf öğrencilerinin empatik becerileriyle aile işlevleri ve benlik kav- ramları arasındaki ilişkinin incelenmesi. Pamukkale Üniversitesi Eğitim Fakültesi Dergisi, 25, 1. Zahn-Waxler, C., & Radke-Yarrow, M. (1990). The origins of empathic concern. Motivation and Emotion, 14, 107–130. ISNAD KÖRÜKÇÜ, Özlem , GÜNDOĞAN, Aysun , OGELMAN, Hülya GÜLAY . "OKUL ÖNCESİ EĞİTİMİ ÖĞRETMENLİĞİ LİSANS ÖĞRENCİLERİNİN BENLİK SAYGISI VE EMPATİK BECERİLERİ ARASINDAKİ İLİŞKİLERİN İNCELENMESİ". 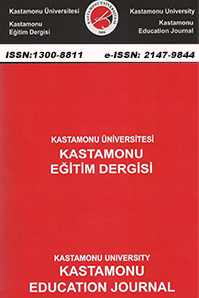 Kastamonu Eğitim Dergisi 23 / 4 (December 2015): 1665-1678.